It seems that with each new quarter I have a new favorite Darden class. Given my engineering background, I expected that the quantitative courses such as finance, accounting, and operations would be my favorites. And indeed, this was the case during my first couple quarters at Darden. It was also no surprise that I earned better grades in these quantitative courses. By the first quarter of my second year it was becoming clear that despite my lower grades in the leadership and strategy courses, I was learning far more in these ‘softer’ courses. I have since embraced the leadership and strategy classes and am taking some of the most demanding offerings. The photo above shows a subset of the books I am reading in the 3rd and 4th quarter of my second year for these ‘soft’ classes. I have now read about two thirds of these books from cover to cover and will finish the rest before graduating in May. There are five additional books for class that I have read on my Kindle (love the Kindle). My pace of reading has increased from about two books per year prior to attending Darden to my current rate of a little over two books per week. Business Ethics Through Literature – in this course we read modern literature and discuss the underlying ethical business implications in class. Some of our reading included: The Great Gatsby, A Thousand Splendid Suns, Never Let Me Go, and Things Fall Apart. 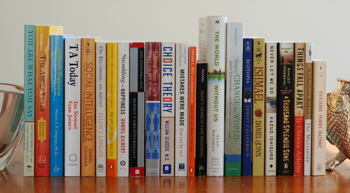 Managerial Psychology – this course covers 14 books on psychology. Thus far, the books have focused on core psychological principals rather than the best selling ‘pop’ culture type books. Some notable readings during my third quarter included: TA Today, You Are What You Say, The Evolving Self, Mans Search for Meaning, and Social Intelligence. I’ll probably write another blog entry on my key leanings after finishing the course. Readings in Sustainable Business and Creative Capitalism – the term ‘sustainability’ is a buzzword (again) and whenever this happens some of the meaning behind the concept is lost. The idea of sustaining business performance or investment returns is age old. This course begins with a historical review of how business and societies have failed. We then discuss ways to structure businesses with sustainability in mind. Some of our readings include: Collapse, Hot Flat and Crowded, and The World Without Us. This is a video from one of my typical days as a Second Year Darden student. I filmed this video on December 9th and it includes clips from first coffee, classes, and the halls of Darden. Charlottesville’s fall colors are exceptionally vibrant this year. 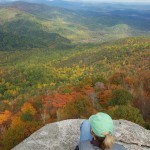 Kristy and I hiked up Old Rag (trail details) with another Darden couple two weekends ago and captured the following photos. 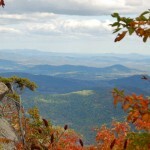 Old Rag is a 10 mile circuit hike located about 30 miles northwest of Charlottesville. We left for the hike at 9:30am and arrived just in time to grab the last parking space at the trail head. Apparently we weren’t the only people thinking this was a good weekend to enjoy the colors. It took us about three hours to hike the four miles leading up to the summit and another two hours to hike the six miles back to our car. The summit approach was fairly slow going as the last mile is a rock scramble and we frequently had to wait for other people at points where hand-over-hand climbing was required. 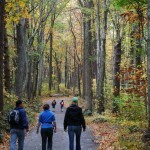 Our weather was perfect and the hike provided some much needed exercise. We all returned to Charlottesville physically tired and mentally refreshed.